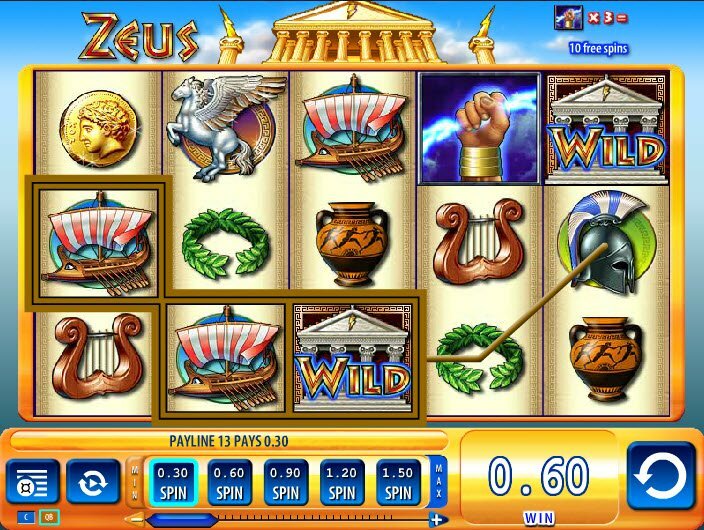 The original Williams Interactive slot machine in the series, Zeus shows his stern side while awarding a huge number of free spins to those lucky enough to feel the magic. With an offer of that many spins for free, you will really see your winnings mount up and this is what will always make the original Zeus slot tempting to players. The Father of Gods and men, the Zeus slot is brought to us by Williams Interactive. Williams Interactive is a long term player in the casino industry; they went online with their experience not so many years back and have brought us this casino floor favourite updated as a 5-reel, 30-payline video slot. The quality Williams Interactive graphics show their extensive experience in producing playable slot games, whether for online casinos or land-based casinos. The game may be ancient, but the graphics most certainly aren't. 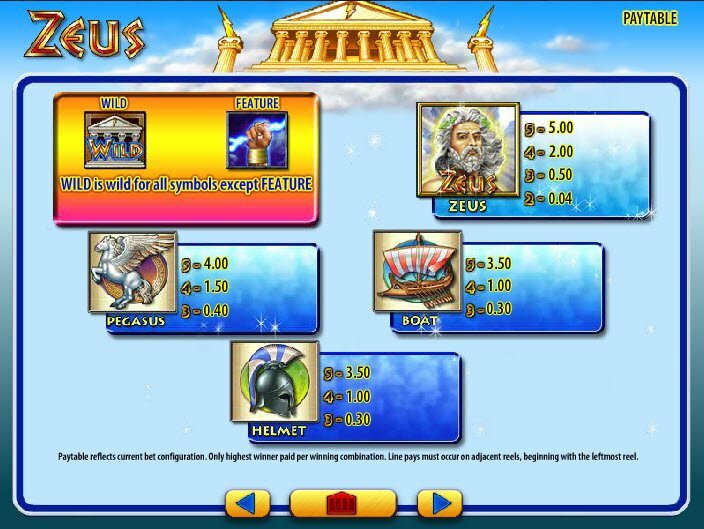 Zeus slot machine symbols are simple and effective. The twinkle of the music as the slots spin their way into place only adds to the anticipation of the mighty thundering strike that will hit when you reel in your winning paylines. While the stern face presenting the Zeus slot machine may strike fear, the 100 free spins Zeus offers on his slot machine will have you jumping with joy. Pegasus flies over a boat as a helmet befitting the Roman Guard helps draw in the cash you need to keep spinning the Zeus 5-Reel Williams Interactive Slot Machine. As harps, gold coins, solver coins, vases and wreaths make their way into the 30 available paylines, you will need to watch out for that lightening to strike and make you a winner. 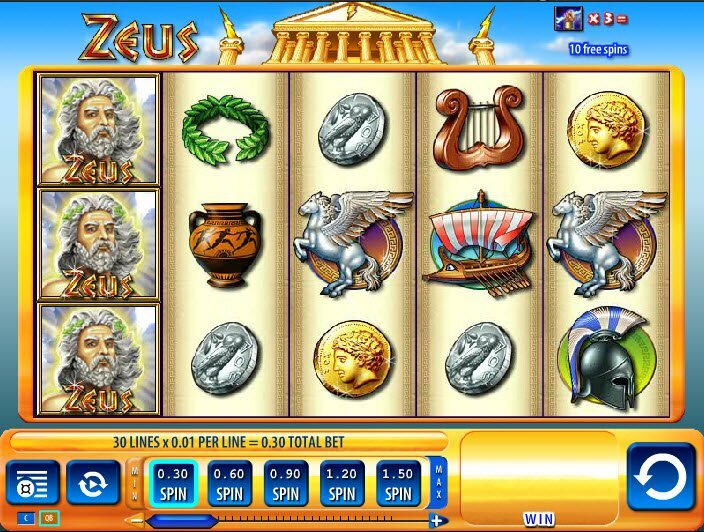 While the stern face presenting the Zeus slot machine may strike fear, the 100 free spins Zeus offers on his slot machine will have you jumping with joy. As he extends his hand, complete with staff, or rod if you like, the reels will jump into spinning mode and collect a nice lump sum amount of winnings for you, no matter what the triggering bet was. The mausoleum is the wild symbol and this will help you increase your chances of winning paylines on the Zeus slot machine, to help leave you believing in myths and gods, and the luck they will bring you. This is a great no-nonsense slot. It’s definitely not going to do much for any slot player who loves lots of bonuses or is looking for a unique experience, but for anyone who just wants to enjoy a good online slot with now fuss, you’ll be happy playing this one.